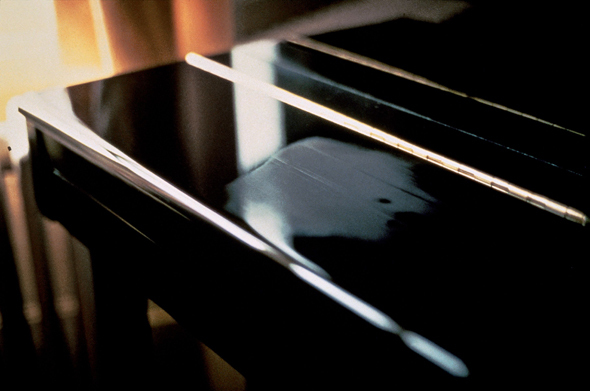 Gabriel Orozco, Breath on Piano, 1993. C-print, 16 x 20 in. Courtesy Marian Goodman gallery, New York, and kurimanzutto, Mexico City. Loaded with double and even triple entendres, the title literally says it all. A Slight Gestuary seeks to function as a kind of reliquary of slight gestures, which is also in and of itself, inevitably slight (mindful of the mathematical impossibility of any kind of exhaustive or encyclopedic presentation of the “slight gesture,” the exhibition can but adumbrate the vast multitudes to which the title alludes). In other words, the theme of the exhibition is: small gestures, big impact. These gestures could be either quite humble, in so far as the physical art work they produce is characterized by a marked material economy, or they could be slight in so far as the gesture, also slight and local, accrues a historical significance which ultimately wields a much larger, and even international impact. Perhaps no historical artist better embodies, or better yet, defines these parameters than the Czech artist Jiří Kovanda. His actions from the 1970s are a case in point. Enacted for the camera or a very small audience in the streets of Prague, Kovanda carried out a series of works, which ranged from hiding from passersby to turning around on an escalator and staring at people, to executing a series of choreographed gestures which were indistinguishable from everyday gestures. Since being popularized in the West, these minor works of poetic protest have accumulated a broad international appreciation, while also retrospectively nuancing the oppressive context from which they issue. For all their initial simplicity, they are incredibly complex pieces whose depth and complexity have only deepened, matured, ramifying outward, over time. A Slight Gestuary pairs living, established and emerging artists with historical artists and instances. Given the size of Lulu (nine square meters) and the ambition of the exhibition to be comprehensive, rather than exhaustive, it will necessarily take place in three successive installations. Each iteration in the space will be accompanied by the online publication of a historical archive, featuring work which consists of documentation (of the original gesture), as opposed to the work itself.